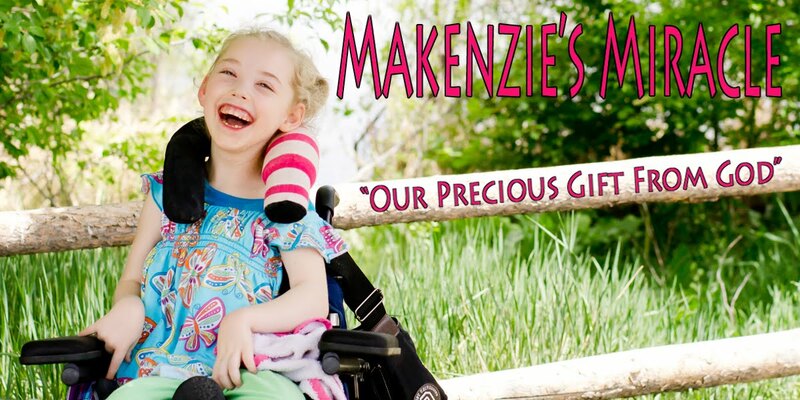 Makenzies Miracle: Makenzie Has so Much to Say! Makenzie Has so Much to Say! 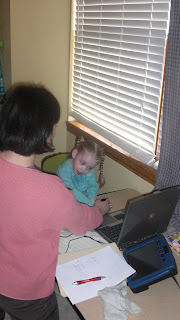 Makenzie had a evaluation with a speech therapist that does Augmentative Communication. 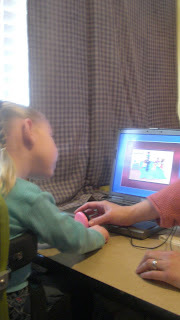 This is a way for Makenzie to talk using computers and switches. She did GREAT!!! It is a quite complicated system as there are many different kinds of talkers (special assistive computers) and different ways you can place the switches based on what part of the body is the most easily controlled with the least amount of effort. Makenzie uses her left arm/hand the best. So the therapist set up the talker to say things like "my name is Makenzie", "I love my mommy", "I like to swing and slide"and,"I have 3 brothers,Zach, Josh and Kaleb". Then she put the switch in fron tof Makenzie and set it to auditory scan. Each phrase had a picture and the computer said each phrase, paused and then moved on to the next phrase. The therapist asked Makenzie to push the switch when she heard something she liked. We we got huge smiles and button pushing! She showed us over and over what she liked the best! It was great!! Then she set up a computer and put in software with songs on it. I picked out 3 that I thought Makenzie would like. She set it up similar to the talker. It said the title of the song and then moved on to the next. When the switch was pushed it would play the song. Makenzie's choices were " Five little monkeys jumping on the bed, " Old Mac Donald had a farm", and the "ABC song". She listened to the choices an then promptly picked the Monkey song. After the song was over it started the choices again. Well my little stinker waited for the monkey song over and over! We listened to it 6 times! The other cool thing is that Makenzie also used her own voice several times while doing this actir to understand launguage and begin to make more of her own words! WOW! There is so much more about this that is SOOO great! I just don't know how to put it into words! I have been in tears (of joy) on and off all day! After 2 years of not being able to know fully what Makenzie wants, today for the first time she got to choose.... and she did! Monkeys, Monkeys, and MORE MONKEYS!!!!!! To see that was something I just can't even begin to put into words!!!! I knew that Makenzie was smart but she really blew me away today!! Auditory Scanning is a difficult skill even for a normal child her age and Makenzie picked it up in about 5 min!!! I can't wait to get this therapy started!!! To do this Makenzie will need a talker (insurance will pay for). The talker will take a bit of time as we will need to weed through all of the many different ones out there. She will need a couple different types of switches, and she will need her own laptop! Yes you read that right... my not even 4 year old needs her own laptop! She is going high tec!!! LOL! God gives us just what we need when we need it! I started to get mad at myself today for not persuing this before but God quickly talked me down and reminded me that His timing is always perfect! Eight months ago when we lost our speech therapist, Makenzie would not have been ready and we may have just written it off as just one more thing that we tried. WOW!!! !